The Montréal Impact were coming into an incredibly busy July schedule on a hot streak, with four consecutive wins and 5 in 6 matches. With the impending load of 6 matches in 17 days, eventually Rémi Garde was going to have to rotate the team, whose lack of depth he had previously deplored. The first opportunity to see several players make their return – or their début, as in the case of Shamit Shome – to the starting lineup. The lineup also featured 5 Canadian players (Piette, Shome, Jackson-Hamel, Edwards and Petrasso) which is of interest as the upcoming Canadian Championship competition requires a minimum of 3 Canadian players in the starting lineup for each team. Whether their presence was preparation for those matches, simple rotation, or a chance for some bench players to compete for more playing time, only coach Garde can say. What anyone who watched that match can say is that none of the players on the pitch rose to the occasion. 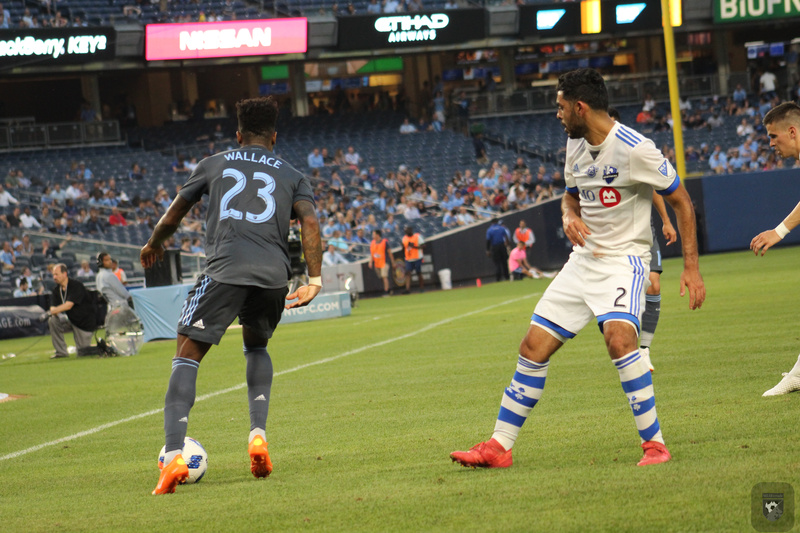 The Bleu-Blanc-Noir failed to register a single shot on target and capitulated in the second half to lose 3-0 to a heavily rotated New York City FC. Although none of the Canadians returning to the lineup will want to remember their performances, two notable disappointments were Homegrown Player Anthony Jackson-Hamel and Raheem Edwards. Jackson-Hamel had made a name for himself last season as a supersub who could come off the bench and score goals late into games. With starting striker Matteo Mancosu’s aversion to scoring goals continuing into its second season, Jackson-Hamel was given a chance to claim a position which is very much up for grabs. Meanwhile, Edwards had lost his starting position on the right wing when Alejandro Silva‘s form picked up, and also had his moment to prove his worth. Both players had previously been publicly criticized for a lack of effort during training earlier this season. Initially, it seemed, they responded to criticism with strong performances in a 4-2 win over New England Revolution. However, in the pair’s first start since May, fans were subjected to watching them play at a jog, with little effort put into winning 50/50 balls and a distinct lack of creativity and tactical awareness. Coach Garde was equally unimpressed, as Jackson-Hamel and Edwards were both substituted in the 59th minute. On a final note of interest, owner Joey Saputo was present at the match. Rémi Garde will hope that the man holding the purse-strings appreciated the opportunity to witness first-hand the difference in quality of players on Montréal’s bench and that of NYCFC. On Saturday, July 14th, the Impact return home to face San Jose Earthquakes, a team whose quality has also been deplored … by one of their players. It should be interesting to see how the two squads crying for an injection of talent face off.